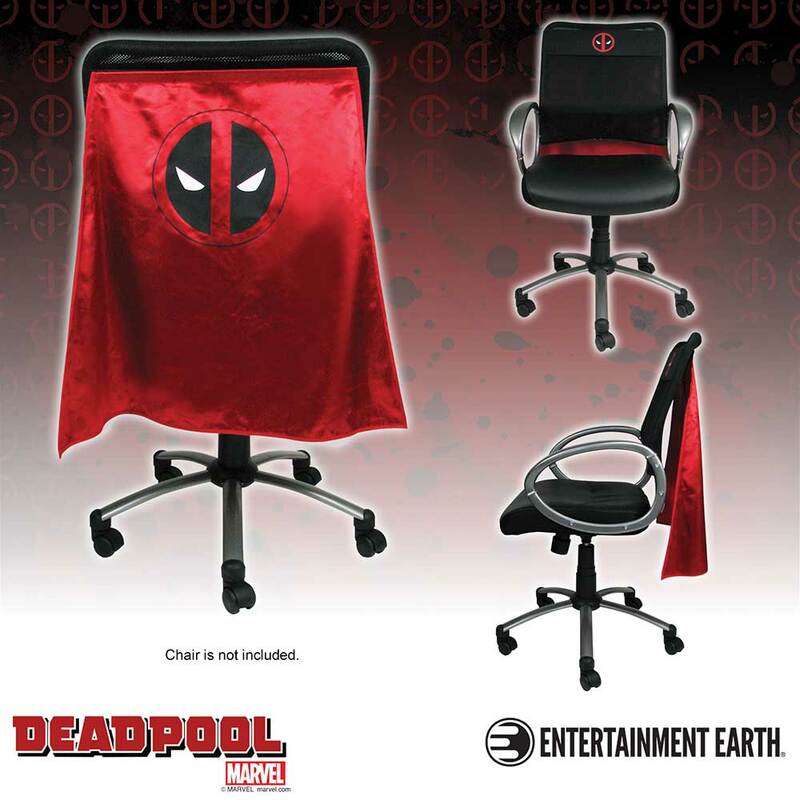 Entertainment Earth Deadpool Chair Cape™ - Now in Stock! The sarcastic, fast-talking "Merc with a Mouth" is ready for your favorite chair with the Entertainment Earth Deadpool Chair Cape - in stock today! 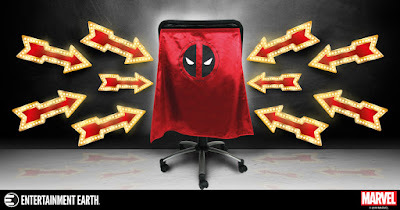 This Marvel Deadpool Chair Cape will transform your tame chair into a seat fit for a wise-cracking hero ready to save the day! 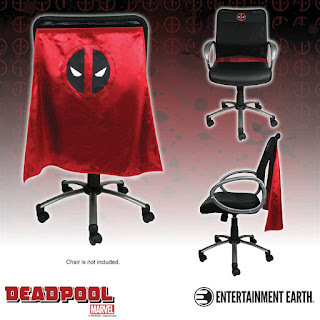 Measuring 24-inches long and 30-inches wide, the classic Deadpool emblem is prominently displayed on a red cape that connects to an adjustable black strap, featuring the same iconic Deadpool insignia. 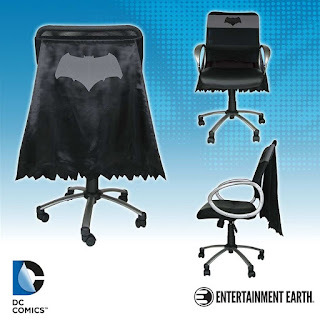 BATMAN™ fans, it's time to cover your bare chair! Be the Super Hero of your office or home with the new Entertainment Earth Batman v Superman: Dawn of Justice Batman Chair Cape - available for order today! The Batman v Superman: Dawn of Justice Batman Chair Cape will alter your tame chair into a seat fit for a Super Hero ready to risk it all in the name of justice! Measuring 24-inches long and 30-inches wide, the grey movie-inspired Bat-emblem is prominently displayed on a black cape that connects to an adjustable grey strap, featuring the same iconic insignia in black. 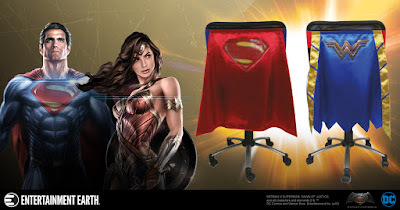 Movie-Inspired WONDER WOMAN™ & SUPERMAN™ Chair Capes™ - Now in Stock! 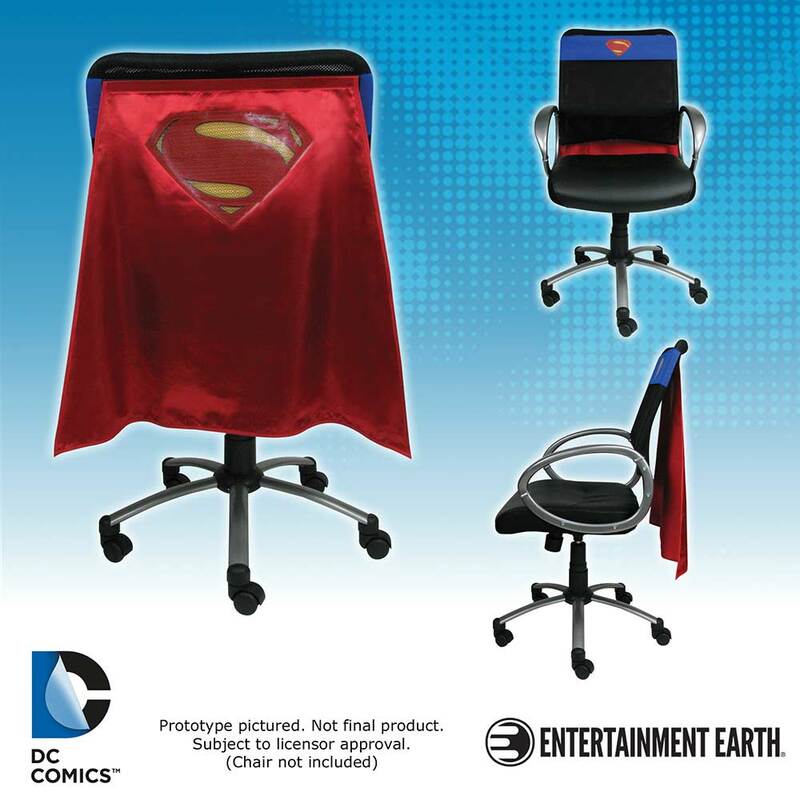 Dress your chair to impress with two new Batman v Superman: Dawn of Justice Chair Capes™ from Entertainment Earth: SUPERMAN™ and WONDER WOMAN™ – now in stock at Entertainment Earth. 'Tis the season for gift shopping, which means three things: big crowds, long lines, and great deals! This year, skip the big crowds and long lines - go straight for the deals and shop at entertainmentearth.com. This week, Entertainment Earth has a Bobble BOGO: Buy 3, Get 1 Free offer - which can help you knock a few people off your list! And Bif Bang Pow! has an awesome selection of Star Trek bobble heads and ships for the Trekkie(s) in your life. 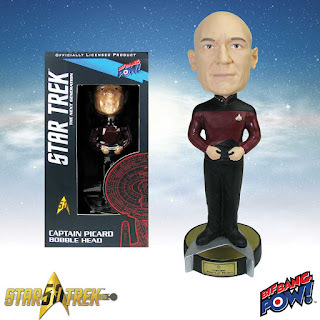 Captain Jean-Luc Picard, commanding officer of the U.S.S. Enterprise, looks spiffy in his dark-red Starfleet uniform with black pants and boots. Made of resin, he stands about 7-inches tall including The Next Generation-themed base. 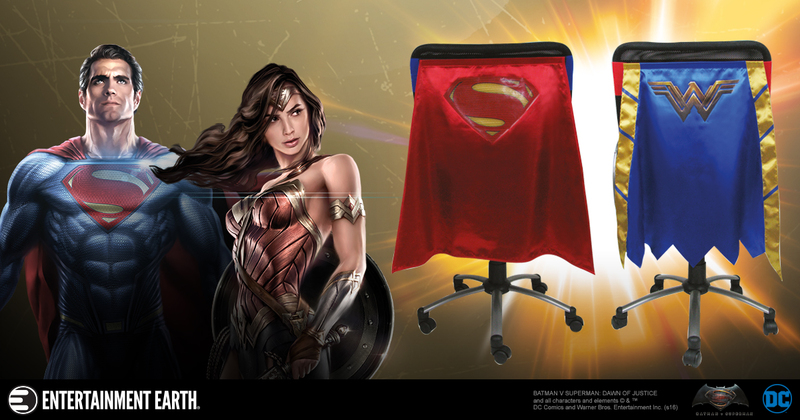 Sculpted by 3D Systems a.k.a. Gentle Giant, the head features remarkable likeness of actor Patrick Stewart. Can you sense nearby Borg activity? She can! Measuring 7-inches tall, this resin bobble head celebrates Star Trek: Voyager's Seven of Nine in her famed red dress from Episode #164, "Human Error," as she stands on top a delta-logo base that includes her name. 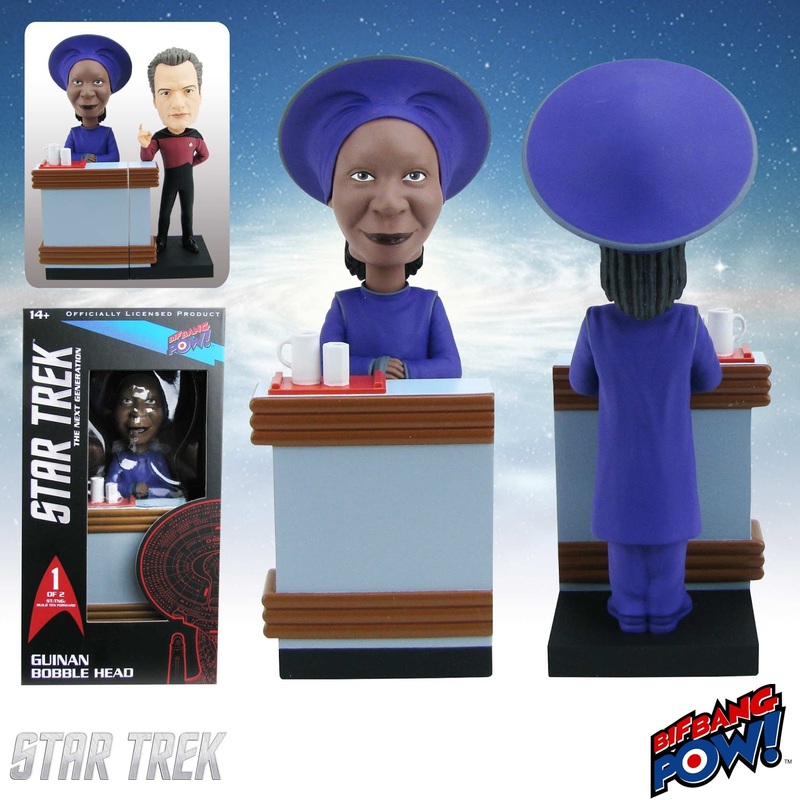 Guinan awaits you in this 7-inch scale resin bobble head that has her dressed in rich purple, standing behind a bar replica from the Enterprise's Ten Forward lounge! Guinan connects with the Q Bobble Head to form a mini Ten Forward bar scene, too. 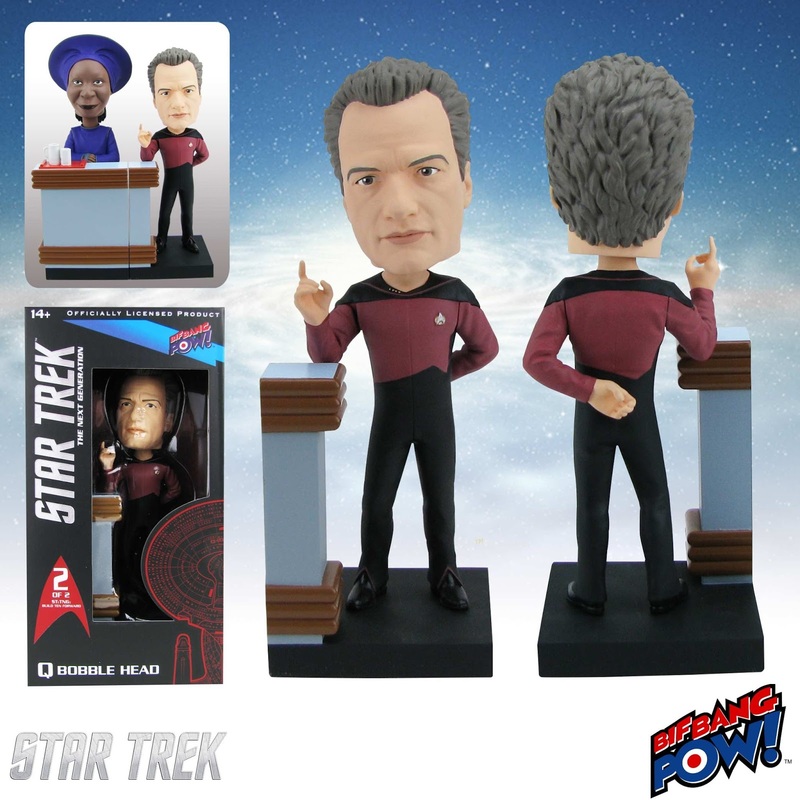 Q bobble sold separately. 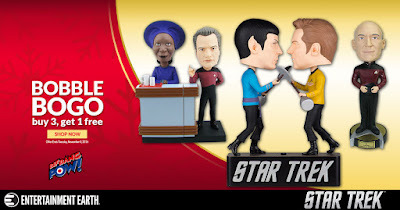 Complete a mini Ten Forward bar scene in true bobble fashion! Looking awesome as a 7-inch scale resin bobble head, Q is wearing his replica of Picard's red uniform and leaning on a piece of the Ten Forward bar that connects to Guinan. Guinan bobble sold separately. Oh My! 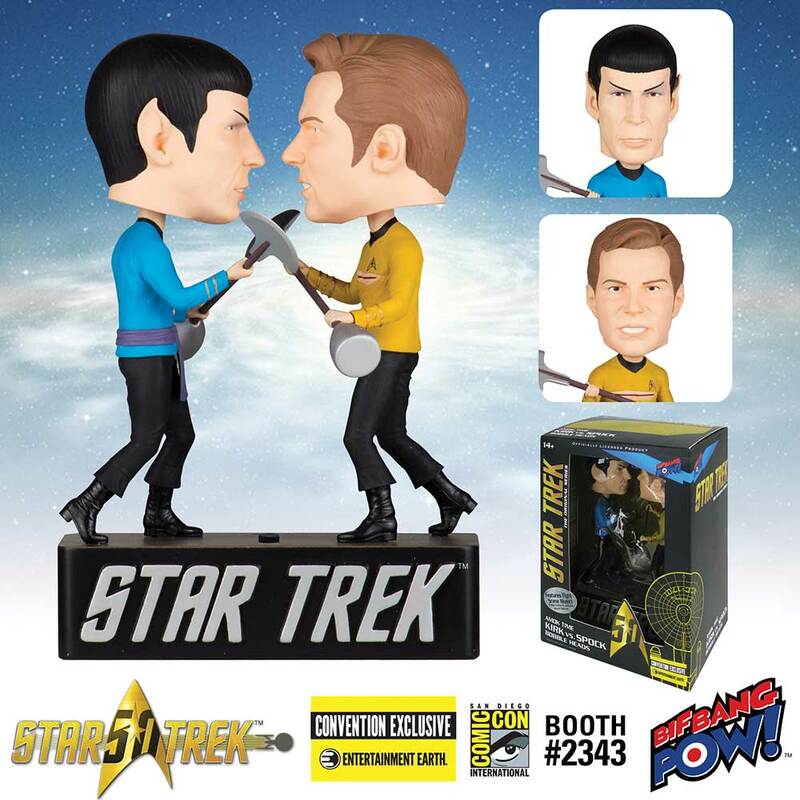 Featuring Sulu (as portrayed in Star Trek: The Original Series episode “The Naked Time”), this unique all-resin bobble is a must have for any classic Trek collector! Measuring 7-inches tall, the muscular lieutenant is showcased with his infamous sword while standing on top a delta-logo base that includes his name. 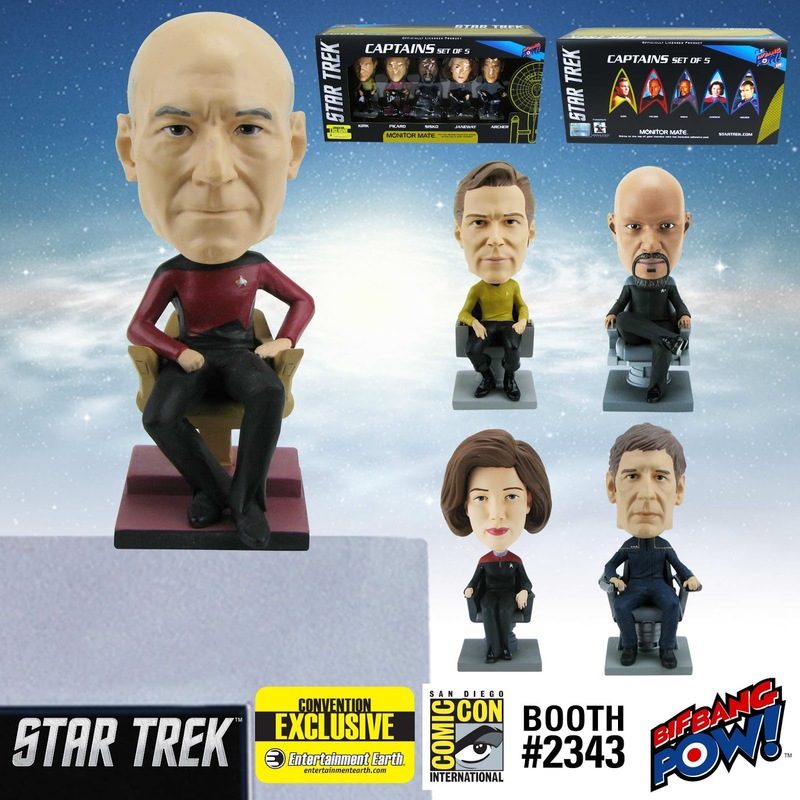 Now collectors can proudly display all five of Starfleets most prominent commanding officers as 4-inch scale miniature resin bobble heads. 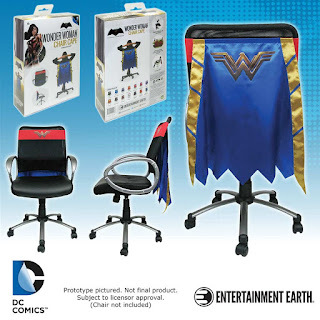 Each figure showcases one of the five captains with their ship specific captain's chair that can attach to a flat surface with a non-damaging adhesive pad on the base. 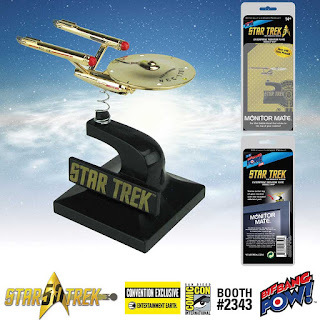 Celebrate the legacy of Star Trek with this one-of-a-kind U.S.S. 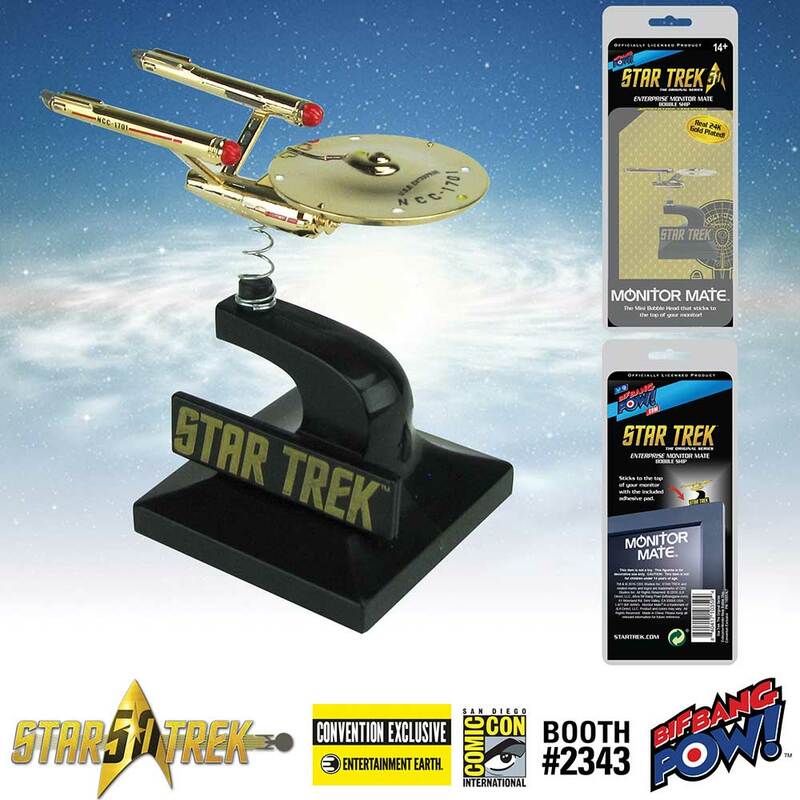 Enterprise NCC-1701 bobble ship plated with real 24kt gold. 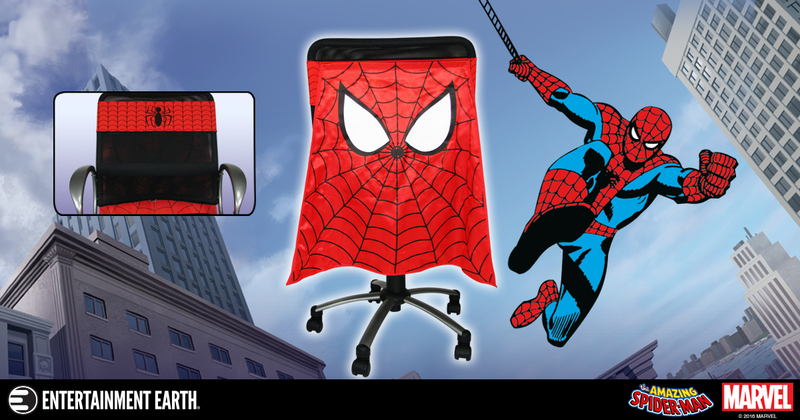 Spring loaded between the ship and the base, the deluxe monitor mate measures 2 1/2-inches long and 2 1/2-inches tall and includes a non-damaging adhesive pad that sticks to flat surfaces. On a Star Trek-themed base measuring 7-inches tall x 4 3/4-inches wide, with lirpa weapons in hand, Kirk and Spock battle and bobble at the head while you look on in astonishment. 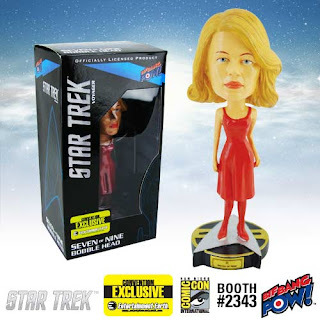 Taken from the "Amok Time" episode, the extraordinary resin piece also plays the music from the fight scene with the push of a button. 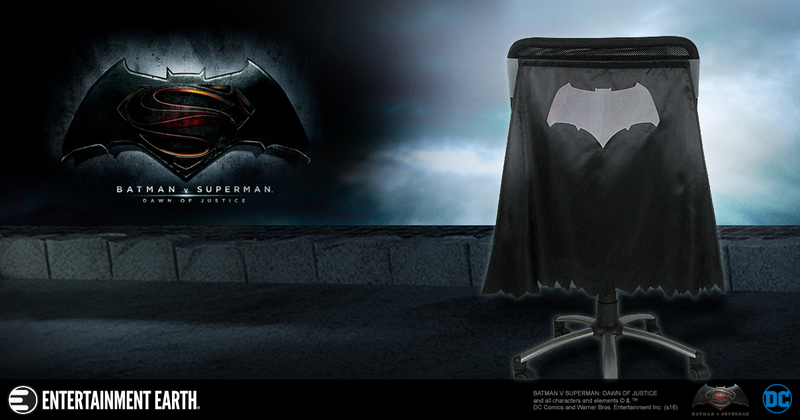 Plus for a limited-time only, receive FREE U.S. shipping on in-stock orders of $59 or more. 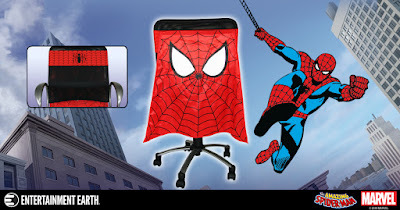 Save even more (while offer lasts) and use coupon code "EARLYBIRD" during check out to save an additional $20 on any in-stock order of $100 or more. Don't wait! 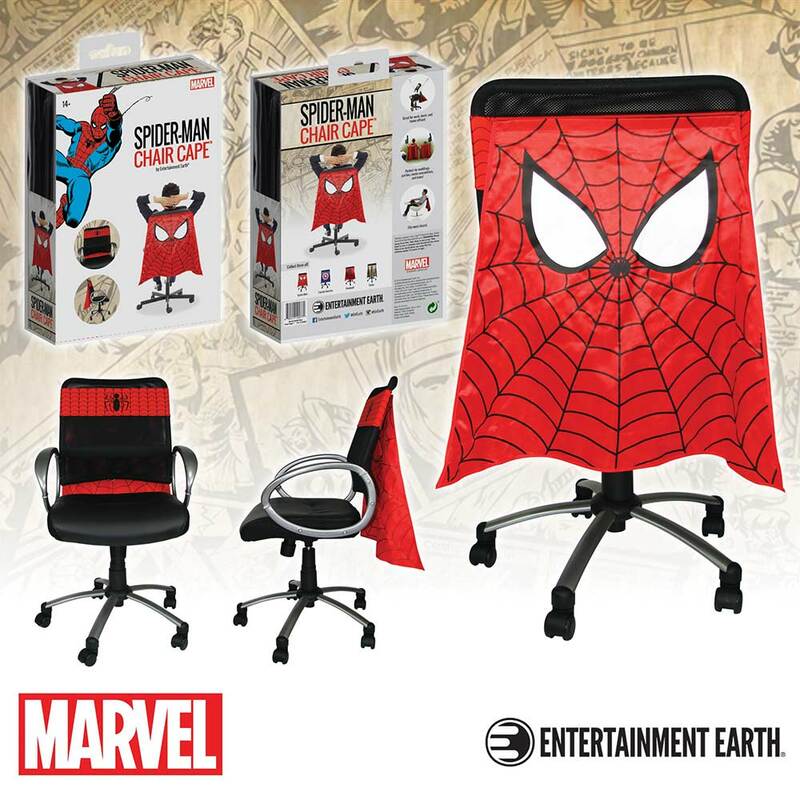 Visit entertainmentearth.com to score these unique items and more today.